This page provides an overview of the extraction framework which is used by the Web Data Commons project to extract Microdata, Microformats and RDFa data, Web graphs, and HTML tables from the web crawls provided by the Common Crawl Foundation. The framework provides an easy to use basis for the distributed processing of large web crawls using Amazon EC2 cloud services. The framework is published under the terms of the Apache license and can be simply customized to perform different data extraction tasks. This documentation describes how the extraction framework is setup and how you can customize it by implementing your own extractors. The framework was developed by the WDC project to process a large number of files from the Common Crawl in parallel using the cloud services of Amazon. The extraction framework was originally designed by Hannes Mühleisen for the extraction of Microdata, Microformats and RDFa from the 2012 Common Crawl corpus. Later, it was extended to be able to extract hyperlink graphs as well as the web tables. The software is written in Java using Maven as the build tool and can be run on any operating system. The current version (described in the following) allows straightforward customization for various purposes. The picture below explains the principle process flow of the framework, which is basically steered by one master node, which can be either a local server or machine, or a cloud instance itself. From the master node the AWS Simple Queue Service is filled with all files which should be processed. Those files represent the task for the later working instances and are basically file references. From the master node a number of instances are launched within the EC2 environment of AWS. After the start up, each instances will automatically install the WDC framework and launch it. Each instance, after starting the framework, will automatically request a task from the SQS and start processing the file. The file will first be downloaded from S3 and will then be processed by the worker. After finishing one file, the result will be stored in the users own S3 Bucket. And the worker will start again at step 3. After the queue is empty, the master can start collecting the extracted data and statistics. Running your own extraction using the WDC Extraction Framework is rather simple and you only need a few minutes to set yourself up. Please follow the steps below and make sure you have all the requirements in place. Amazon Web Service Account/User: As the framework is currently tailored to be run using services from Amazon, you will need to have an AWS with sufficient amount of credits. The user needs rights to access the AWS Services: EC2, S3, SQS and Simple DB. AWS Access Token: In order to make use of the Amazon services through the framework you need have your AWS Access Key Id as well as your Secret Access Key. Both is available through the Web Interface of AWS in the section IAM (See AWS IAM Docs). In case you do not have access to this section with your user, contact the administrator of your AWS account. awsAccessKey and awsSecretKey: Those keys are mandatory to get access to the AWS API and run any commands. ec2instancetype: Defines the type of EC2 instances which will be launched. In order to find out which instance type suits your needs best, visit the ec2 instance type website. Former extractions by the WebDataCommons team were mainly done using c1.xlarge instances. org.webdatacommons.hyperlinkgraph.processor.WatProcessor, which was used to extract the hyperlink graph from the .wat files of the Spring 2014 Common Crawl dataset. org.webdatacommons.structureddata.processor.ArcProcessor, which was used to extract the RDFa, Microdata and Microformats from the .arc files of 2012 Common Crawl dataset. org.webdatacommons.structureddata.processor.WarcProcessor, which was used to extract the RDFa, Microdata and Microformats from the .warc files of the November 2013/2014/2015 Common Crawl dataset. org.webdatacommons.webtables.processor.WarcProcessor, which was used to extract the Web Tables from the .warc files of the July 2015 Common Crawl dataset. This code was mainly derived from the Dresden Web Tables Corpus repositories (Extractor|Tools). All these classes implement the org.webdatacommons.framework.processor.FileProcessor interface. Package the WDC Extraction Framework using Maven. Make sure you are using Maven3, as earlier versions will not work. Note: When packaging the project for the first time, a large number of libraries will be downloaded into your .m2 directory, mainly from breda.informatik.uni-mannheim.de, which might take some time. By following the commands below, you will first push your .jar file to S3. 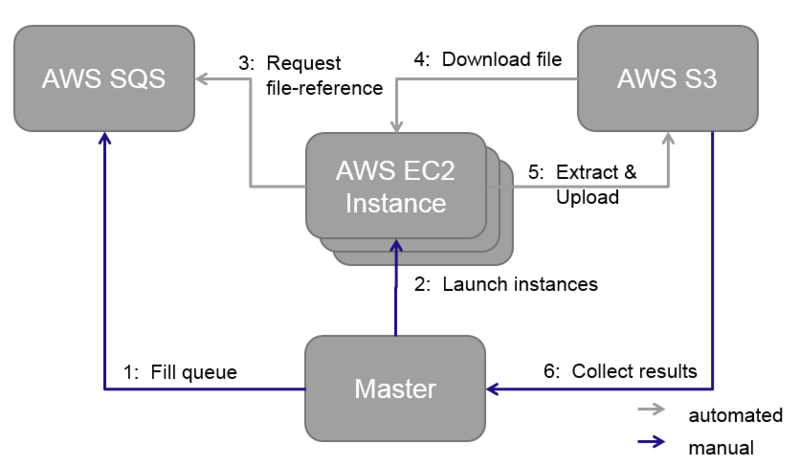 Next, you fill the queue with tasks/files which need to be processed and then start a number of EC2 instances which will execute the files. You can monitor the extraction process and after finishing stop all instances again. It also includes commands to collect your results and store it to your local hard drive. Note: Please always keep in mind that the framework will make use of AWS services and that Amazon will charge you for their usage. Please note, that the queue command is just fetching files within one folder. In case you need files located in different folders use the bucket prefix file option of the command. You can also limit the number of files pushed to the queue. Start to launch EC2 extraction instances from the spot market. The command will keep starting instances until it is cancelled, so beware! Also, the price limit has to be given. The current spot prices can be found at http://aws.amazon.com/ec2/spot-instances/#6. A general recommendation is to set this price at about the on-demand instance price. This way, we will benefit from the generally low spot prices without our extraction process being permanently killed. The price limit is given in US$. Note: It may take a while (approx. 10 Minutes) for the instances to become available and start taking tasks from the queue. You can observe the process of the spot requests within the AWS Web Dashboard. For additional information and parameters which might be useful for your task you can have a look in the documentation of the different commands or have a look in the implementation class org.webdatacommons.framework.cli.Master. In this section we show how to build and run your own extractor. For this task we think about a large number of text files (plain .txt files), where each line consists of a number of chars. We are interested in all lines which only consists of numbers (matching the regex pattern [0-9]+). We want to extract those "numeric" lines to a new file and in addition we want to have two basic statistics about each file: the total number of lines of the parsed file and the number of lines which match our regex within the parsed file. The interface is fairly simple, as it only contains one method, which receives a ReadableByteChannel, representing the file to process and the files name as input. As result the method returns a Map<String, String> of key value pairs containing statistics of the processed file. The returned key value pairs are written to the AWS Simple DB (see property sdbdatadomain of the dpef.properties). In case you do not need any statistics you can also return an empty Map. In addition, the WDC Extraction Framework offers a context class, named ProcessingNode.java, which allows the extending class to make use of contextual settings (e.g. AWS Services to store files). In many cases it makes sense to first have a look into this class before thinking about your own solution. Creating a BufferedReader from the ReadableByteChannel, which makes it easy to read the input file line by line. Creating a BufferedWriter for a temporal file, which will be deleted as soon as we exit it. This ensures that the hard drive will not be flooded, when processing a large number of files or large files. Processing the current file line by line, counting each line. In case a line matches the regex ([0-9]+), the line is written - as it is - into the output file and the corresponding counter is increased. Writing the output file, which includes only the lines consisting of numbers to S3 using the context from the ProcessingNode. The two basic statistics, number of lines and number of matching lines are put into the map and returned by the function. The statistics are written into the AWS Simple DB automatically by the invoking method. Having adjust all necessary properties you can package the project and follow the commands as described above. In general, the framework is tailored to be used with AWS only as it depends on key services provided by AWS, the SQS and S3. Input files, which should be processed need to be stored and available within AWS S3. The framework currently does not allow you to queue and process files stored. Statistics, created while processing files will be stored with AWS SimpleDB. At the moment is not possible to switch this option on/off or change the location, e.g. to an own data base. In case you customize the framework in any case, and think this could be helpful for others, we would be glad to hear about and integrate your improvements within the repository and make them public to everybody. Some of the datasets, which are available at the Web Data Commons website were extracted using a previous, not that framework-like version of the code. In case, you want to re-run some of the former extractions, or need some inspiration on how to processes certain types of files (e.g. .arc, .warc., ...), the code is still available within the WDC repository below Extractor/trunk/extractor. The usage of the WDC framework is free of charge. Nevertheless, as the framework makes use of services from AWS, Amazon will charge you for the usage. There are several granting possibilities by Amazon itself, where Amazon supports ideas and projects running within their cloud system with free credits - especially in the education area (see Amazon Grants). More information about Web Data Commons is found here.